Avalanche Software, the developer responsible for Disney Infinity, based the idea of the Toy Box mode in the game on the corresponding mode in the Toy Story 3 video game, which the team developed in 2010. The open-ended mode added an incredible amount of replay value to the Toy Story game, and is now a core feature of Disney Infinity. The Toy Box mode in the Toy Story 3 game actually had a western theme but Avalanche is changing it up for Disney Infinity by giving the play set a fresh space theme. The title of the play set? Toy Story in Space! 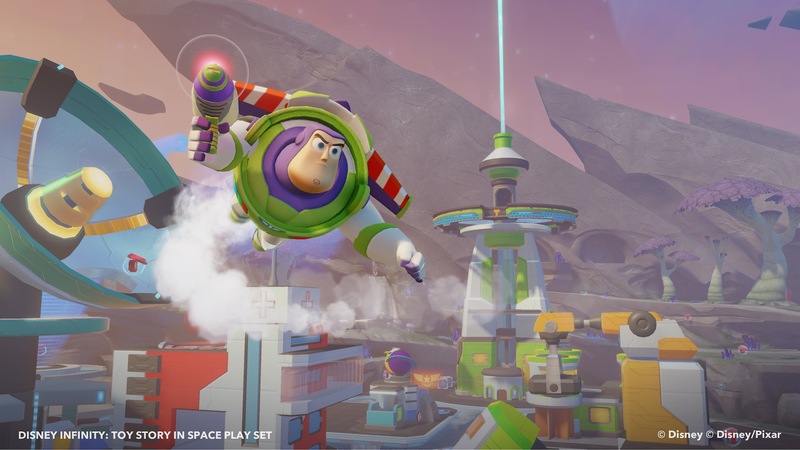 The Toy Story in Space Play Set is the sixth Play Set to be released for Disney Infinity and features Buzz Lightyear and Jessie in the pack, with Woody sold separately. Players will have the ability to defend the new colony and friends by unlocking new Space Ranger equipment. The Toy Story in Space Play Set introduces hoverpacks, jetpacks, laser blasters, goo blasters, new mounts and more into the Toy Box mode. The Toy Story in Space Play Set, which includes the Buzz and Jessie figures, along with the Play Set piece unlocking the Toy Story game, will be go on sale for a suggested retail price of $34.99 on Tuesday, October 22. The Woody figure, which has been available early exclusively at Wal-Mart, will join the Play Set at all video game retailers on Tuesday and can be yours for $12.99.